Just over eight months to go; on Monday 3rd October to be precise it is 257 days, that is all before the first ball will be hit in anger at the 19th World Veteran Championships in the splendid surroundings of the Las Vegas Convention Center in Nevada. Proceedings are scheduled to commence in the celebrated United States city on Monday 18th June and will conclude on Saturday 24th June. 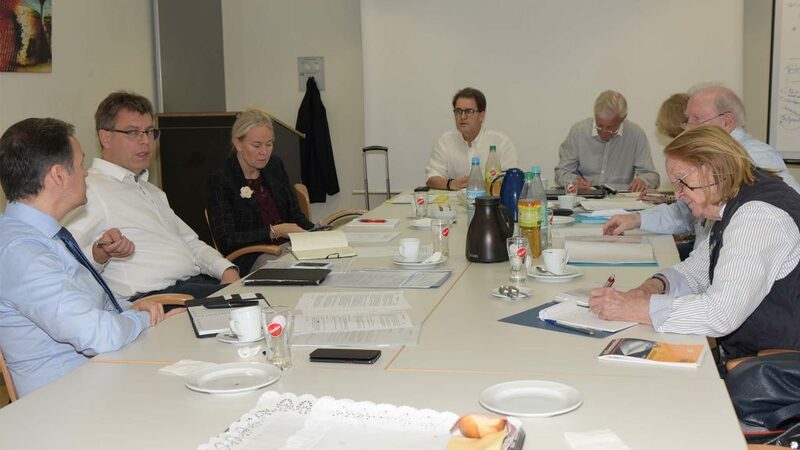 Time pressing, recently on Sunday 1st October at the German Table Tennis Centre in Düsseldorf, Thomas Weikert, ITTF President and Petra Sörling, ITTF Executive Committee member alongside Raul Calin, ITTF Secretary-General, met members of the Swaythling Club International and World Veteran Championships Committee; the major item on the agenda being to assess the current situation. Present on behalf of the Swaything Club was Ebby Schöler, the President, and his wife Diane, the Honorary President, alongside Reto Bazzi, Chair of the ITTF Veteran’s Committee, Gloria Wagener, the Secretary and Hans Westling, Chair of the World Veteran Championships Committee. A good idea at the time, first staged in 1982 in the Swedish city of Gothenburg, some 400 players entered; at the most recent edition in 2016 in Alicante/Elche that number had risen to a record 4,600 players. Now in 2018, the organisers in Las Vegas are preparing for 5,000 players! The event has become not just a major table tennis competition; it goes beyond the boundaries of sport. It is an event where table tennis is the reason; friendship, understanding, respect and conviviality are the effects. The atmosphere is always most cordial and that was the tone when the officials gathered in Düsseldorf. Items on the agenda included future responsibilities, the structure of committees, necessary alterations to regulations, a World Veteran Team Championships and an ITTF World Veteran Tour. Following the meeting, all stayed to watch the Bundesliga match between Borussia Düsseldorf and Fulda Maberzell; two wins from Timo Boll guided the home team to victory. It is anticipated that the next 2018 World Veteran Championships meeting will take place in Düsseldorf next February.